Outlaw02's PC Build Logs, My pc, my dad's, and my mom's. Well, over the years I kept saying that I would get myself a new cpu and talk about it for a bit, and then disappear, not buying it at all. 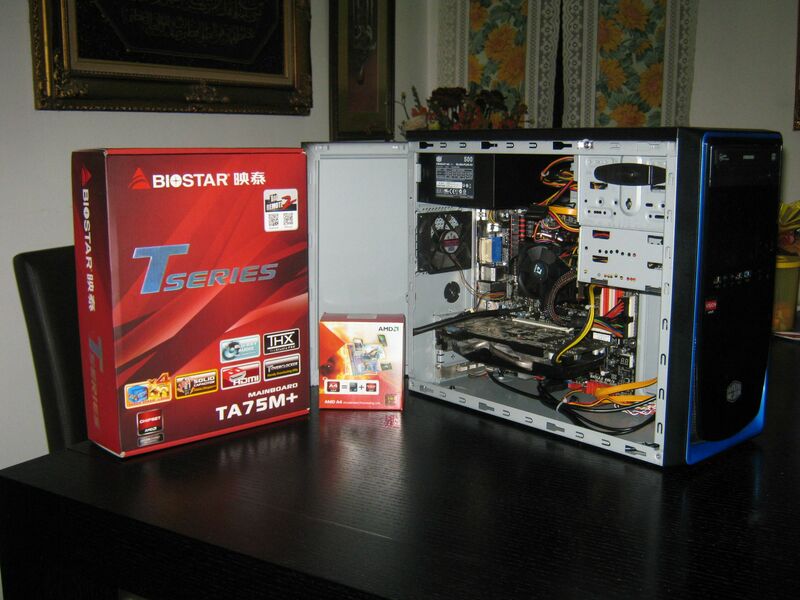 This time round, however, I got round to actually purchase and build my custom pc. The current build isn't complete yet, as I'm waiting for my next pay coming in a few days time to finish up the build. List below are the specs of my current build. 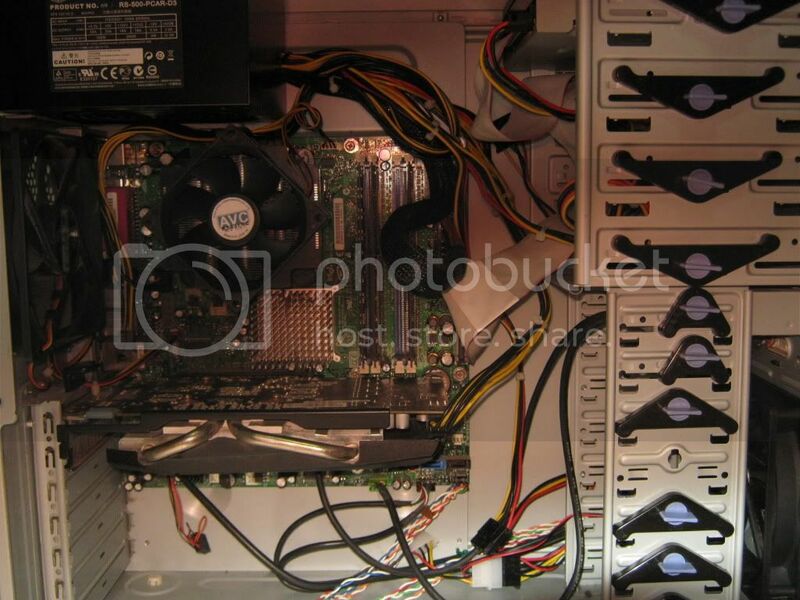 - Currently relying on its ATi Raedon HD3000 IGP as graphics. 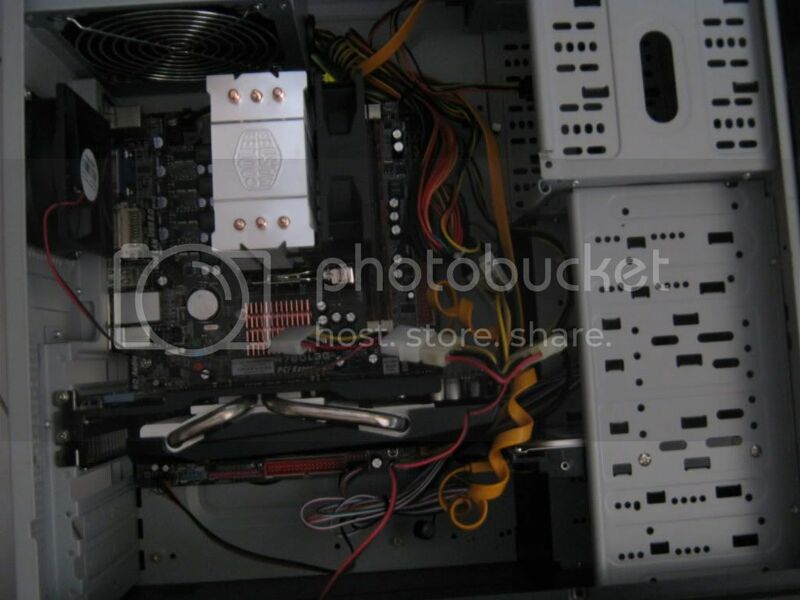 The only thing I would need some advise is the GPU part, where I'm looking for something that has good performance, but not extravagant in price. Something of a mid-range price will do for me. Do you guys think the GTS450 would do just fine? Preference would be of Nvidia GPUs unless the ATi ones outdo them. I have the Claro of this brand, and it's amazing. Don't get Creative because they have awful technical service and driver support. HT|Omega have like, the opposite. 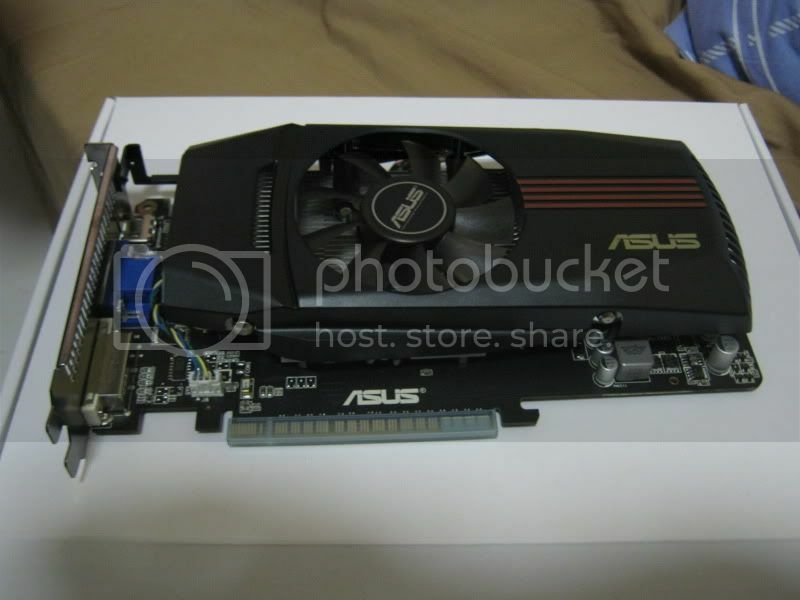 For the grahic card, I suggest you get the GTX 550 Ti. 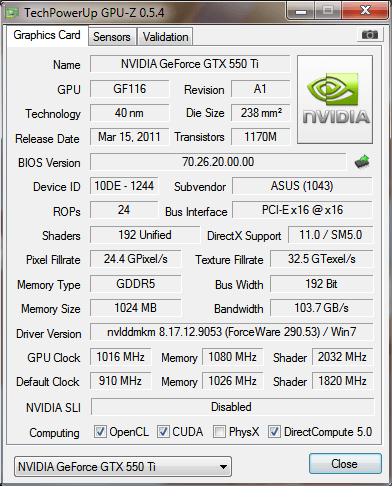 Good capabilities, some makers overclocks it in factory and DirectX 11. I suggest nVidia over AMD. Thanks for the graphics card suggestion, seems reviews online about it fare favourably well. I might consider getting it. As for the sound card, unfortunately, HT|Omega doesn't sell their sound cards here locally, and I'm very much limited to eiher Creative, or AsusTek ones. Maybe I should try AsusTeK ones? Depends on what you'll do with it, if you play lots of EAX games then go with a Creative(do not get the xtreme audio, it's just an audigy 2 with a different name), otherwise the Asus cards are apparently better sounding and will do software acceleration EAX. Well, I went round and bought the 2GB ram, and a graphics card. I decided to rummage around the house and found a good old Creative Audigy Value sound card lying around, so might as well use that for now. 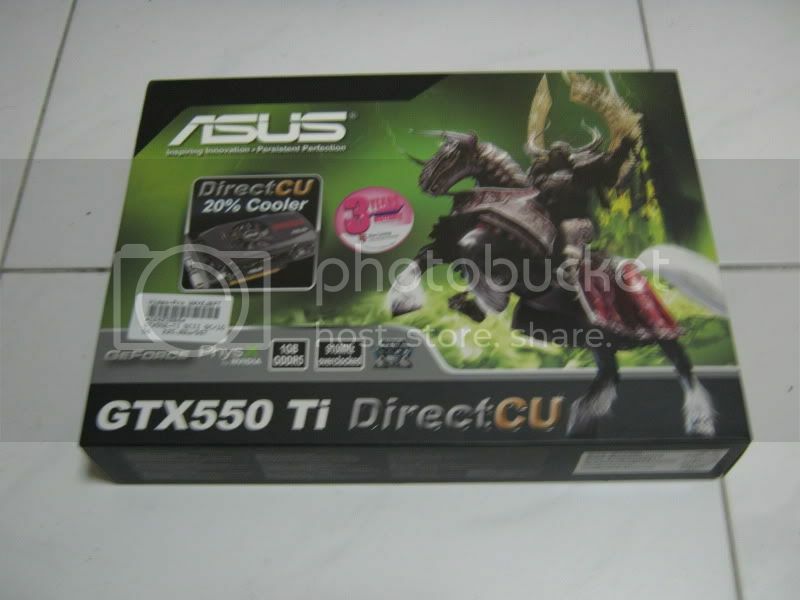 Yep, I bought meself an Asus GTX550 Ti Direct CU instead of the Palit variant. Well, it's been a few weeks, and already I'm planning on having a second computer build, though this time for my dad to replace his dinky Lenovo Net-top. 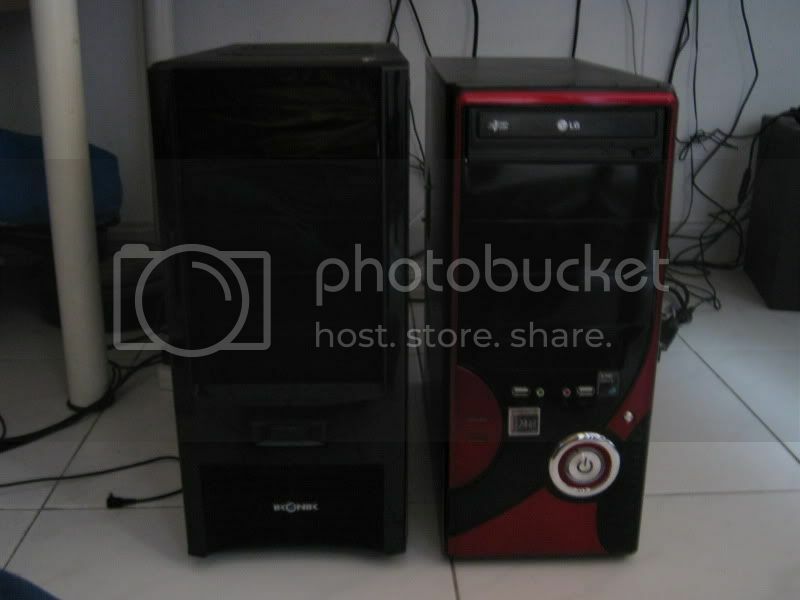 Considering that I'm getting a Phenom II X6 1100T, the Athlon II X4-640 would be for my dad's system. 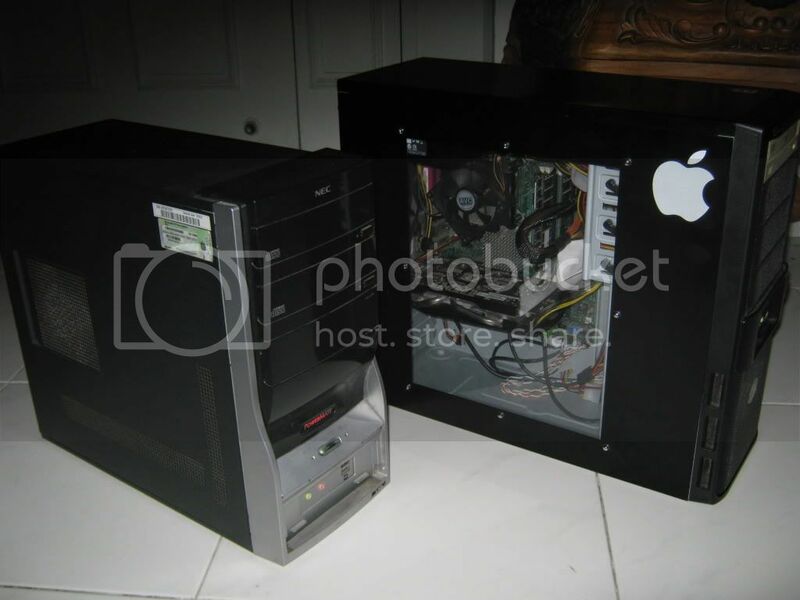 And since my dad only uses his computer mainly for watching youtube videos on high definition, emails, simple photoshopping, and facebook activities, here's what I propose to making his custom computer, though his main criteria would be a slim casing, and black in colour to blend in with the other electrical devices. The white Lenovo Net-top hasn't gone well blending with the black 42 inch Samsung LED TV. One thing while I was planning for my dad's system was the concern of cost, hence I was unsure if I should get my dad a dedicated GPU instead of relying on the mobo's GPU. So what would be your recommendations for my dad's planned system? As far as I know, he is willing to fork out half of the total sum. Into the year and I realised that I've been doing a lot of updates on my current pc system build. Because of this, here are some pictures to show where my pc has gone, well, performance wise. If one was aware in the recent purchase thread, I've bought several parts, and well, deviated away from what I had intended to buy in the first place. 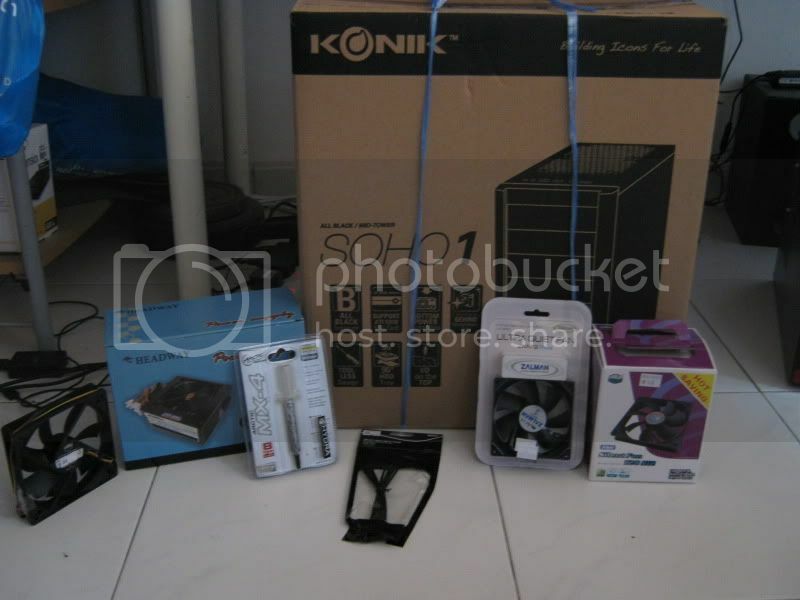 Indeed, I went ahead and bought the X6 1100T, as well as an aftermarket cpu cooler, the Coolermaster Hyper TX-3. I could have gotten the Hyper 212+, but the casing size made it a very tight squeeze. How the system was back then, and very messy as well. From there, I went on buying more stuff, biggest key point would be a better casing, the Ikonik SOHO1. 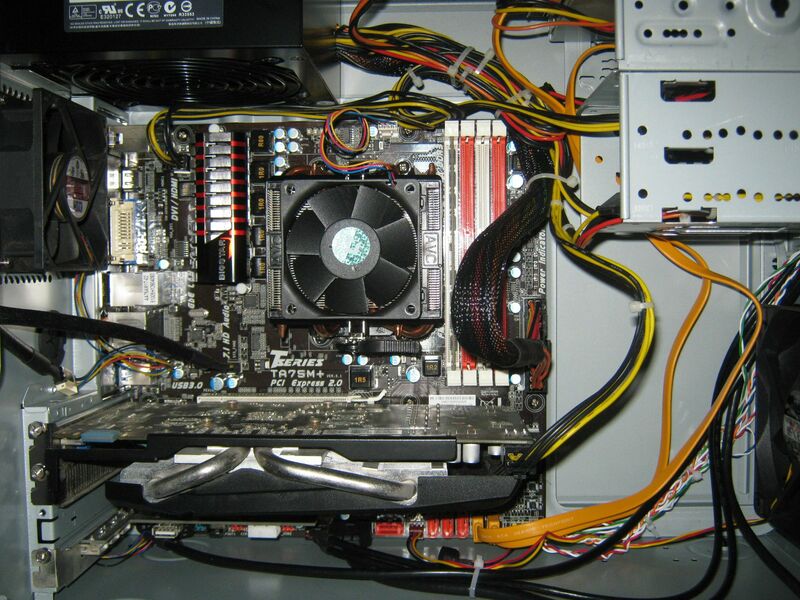 The Zalman 92mm fan was bolted to the cpu cooler, hence now it is a push-pull config. 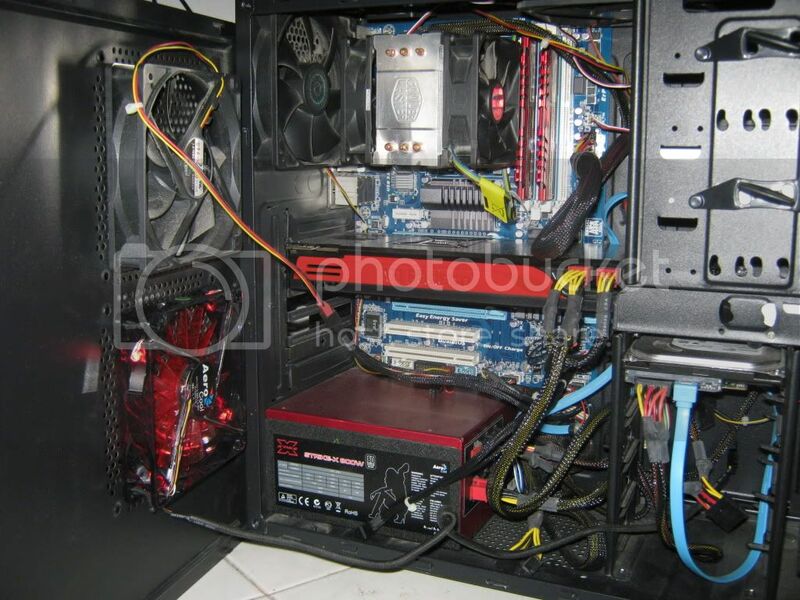 That Headway PSU was the biggest mistake of my life, especially when I was not aware about the 80+ efficiency thing on PSUs back then. How my system currently looks on the inside. 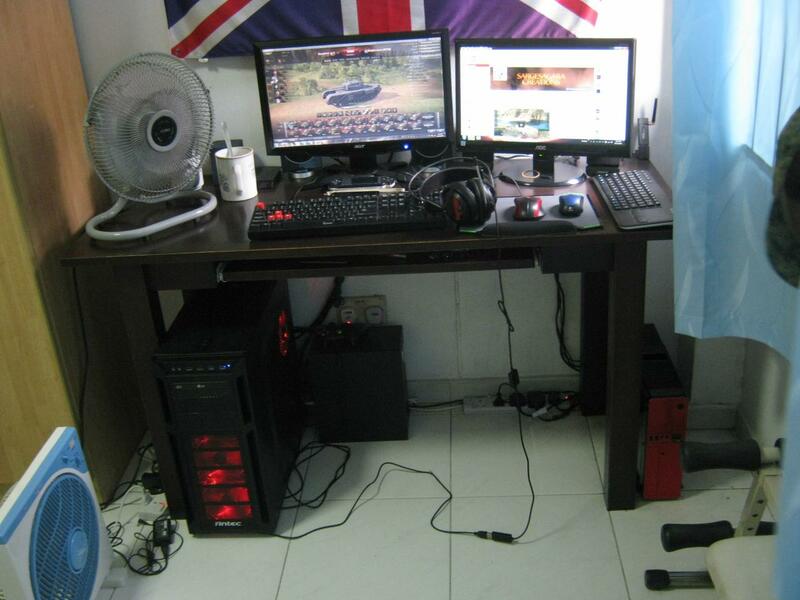 Still messy, and yes, I can't turn the HDD around. For some reason it can only lock in place as it is. And yes, I ditched the Creative Sound Card altogether. And since now I'm being more realistic in getting stuff, (Yeah, I'm such a daydreamer when it comes to planning on buying stuff at times.). Here's the low-down on the further updates to my system, based on the monthly allowance I've been getting from the army. My side done, now about my dad's HTPC side, there has been progress. Since he wanted to reuse the parts I have in storage, I've pretty much scratched my planned parts for my dad. And now since he's fully forking out the money for the parts, I'm aiming to spend as little as possible. Casing - That red, bling, cheapass casing I had. What are your opinions on this, and could this be improved? 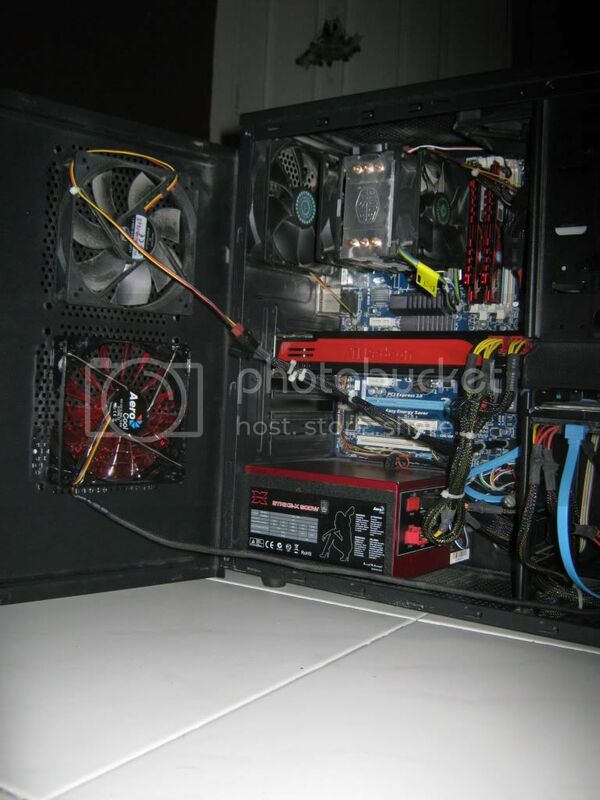 btw its a nice build and its cool how you keep upgrading it all the time, i really wouldnt be bothered on constantly upgrading my computer unless i really needed to. Haha, you're kind of right that I should stay on with my current GPU, and just overclock it further. The impulse of myself having the urge to upgrade my gpu was the fact that all of my friends that has custom PCs have upgraded or bought new systems, and all of them have a minimum of a GTX560Ti or an AMD equivalent. That pretty much makes me in the dust in some way. 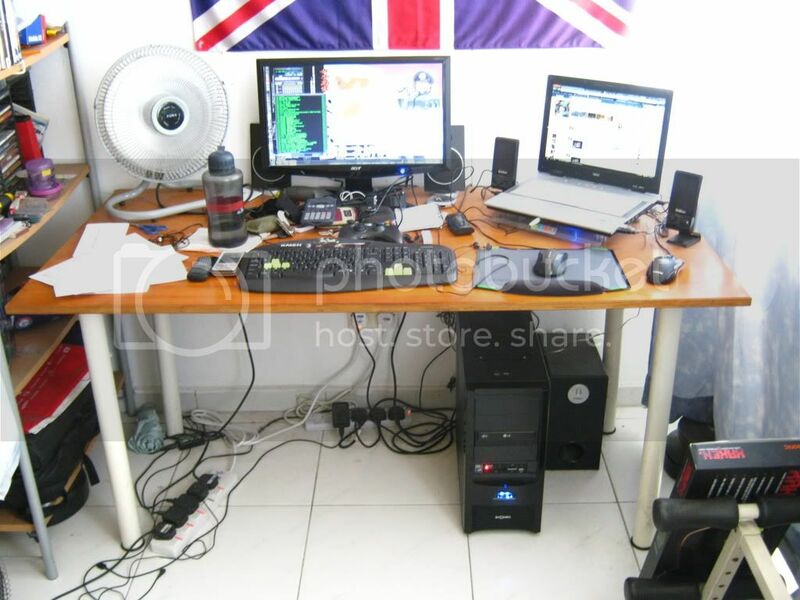 Though, I may look my sights down a little and get a GTX560Ti if there's a need. The flight simulator lags at times when the gameplay get chaotic on my GTX550Ti. Hello mates, it's been a while since my last update, and well... a lot of things have deviated from my initial plans. 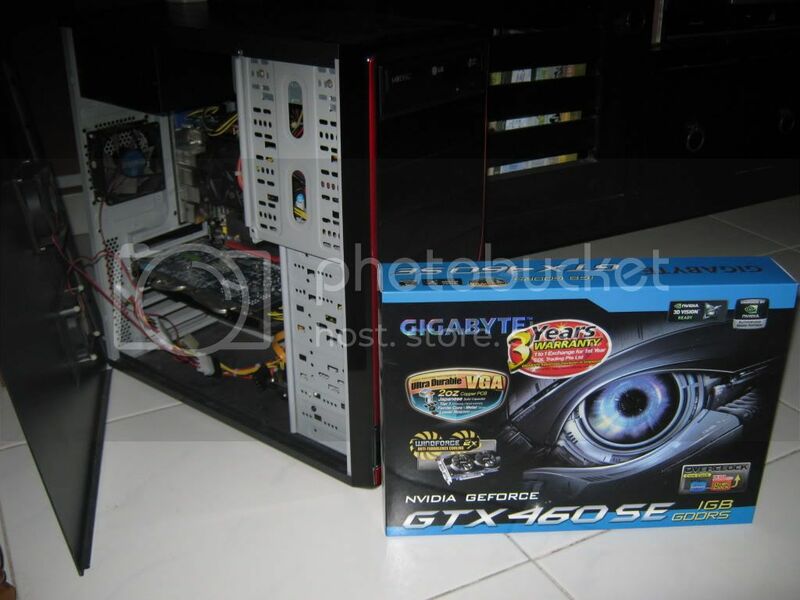 For my PC, I've managed to get hold of a second hand ATi Radeon HD5870 Reference Card for SGD$160 (About USD$124), and well, had a tough squeeze into the casing. A sign that it's time for me to change my casing it seems. Maybe the Fractal Design Midi Arc would suit fine. Also, I've bumped up my ram size to the optimal 8GB. 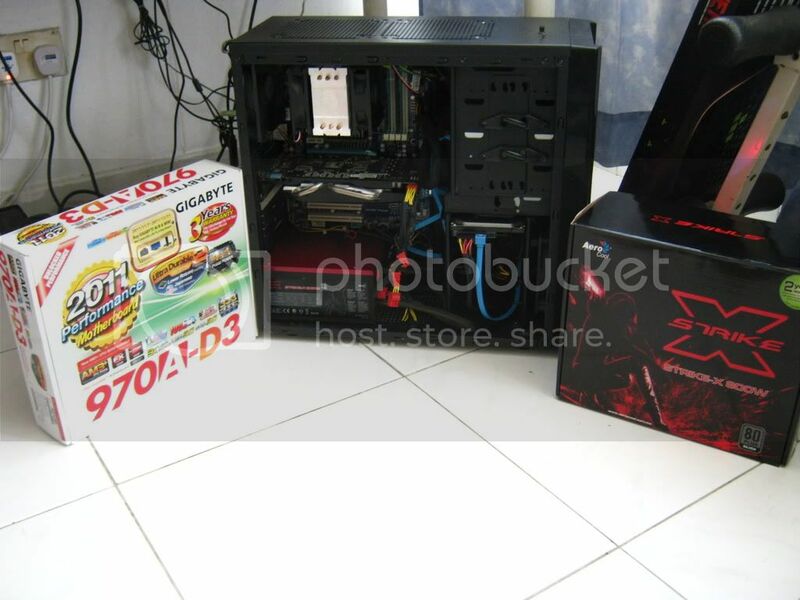 Bought a G.Skill RipJaws 1600MHz 4GB x 2 Kit. And... cable tied the arse out of it. 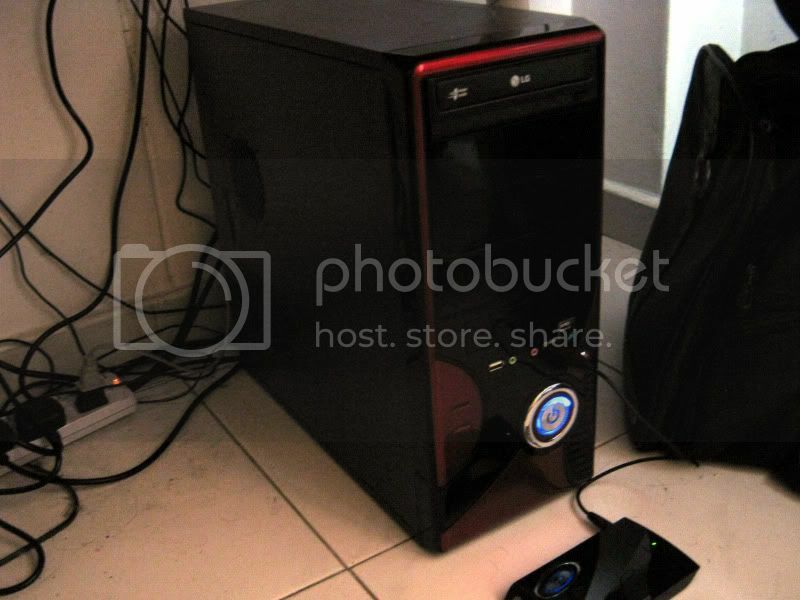 As for my dad's HTPC, well, the Gigabyte GTX460SE ended up in there, replacing the Palit GT440, and my God it goes on full assault on HD videos and 1080p gaming. Maxed out on Fable 3 on 1080p no problem, NFS: Hot Pursuit 2010 as well. 8GB of ram is boosted to 12GB 1333MHz, from both Kingston and G.Skill. 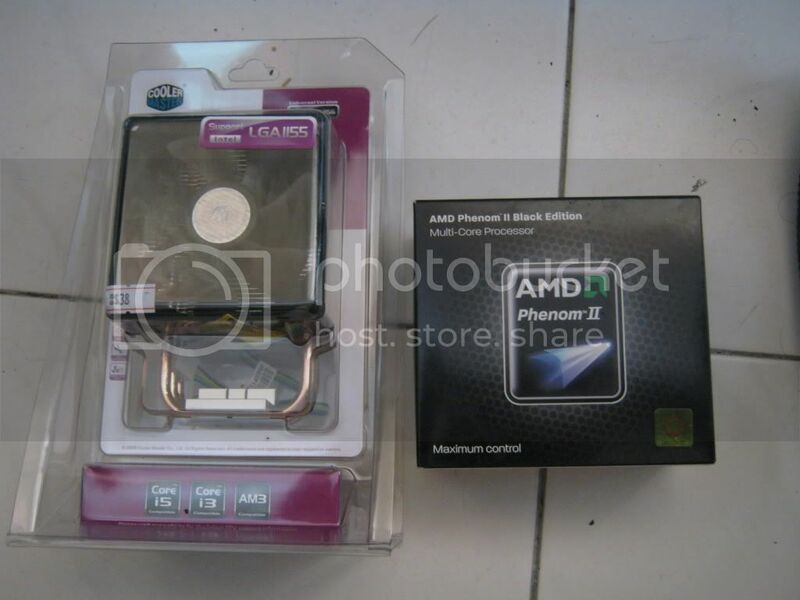 The possibility of changing my mom's pc from Intel to AMD is high, but a matter of when. Well, time for a huge update after such a long long long time. 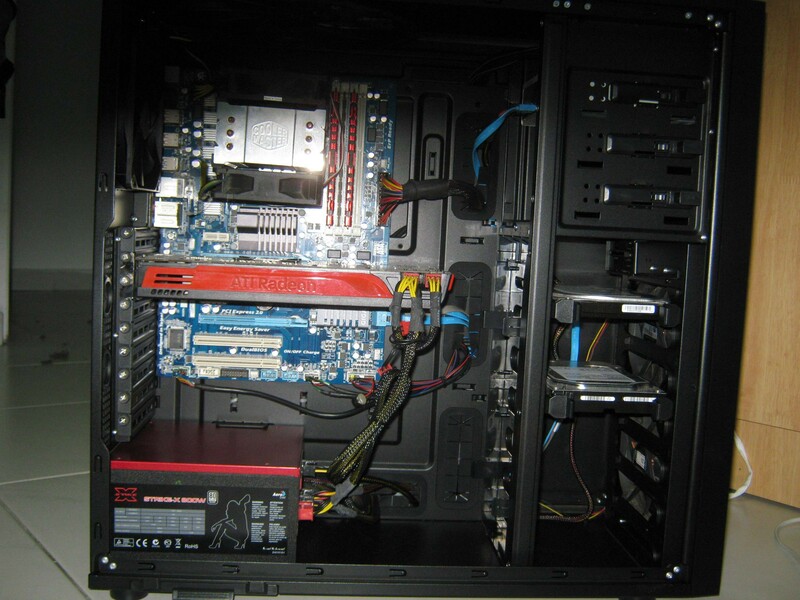 I was never satisfied with my main PC's build, as the case was just too cramped, leaving a big mess of wires all over the place in the Ikonik case. Because of that, I bought a bigger case, though still labelled as MATX case, when it doesn't to me. Image size reduced, original size: 2816 x 2112. 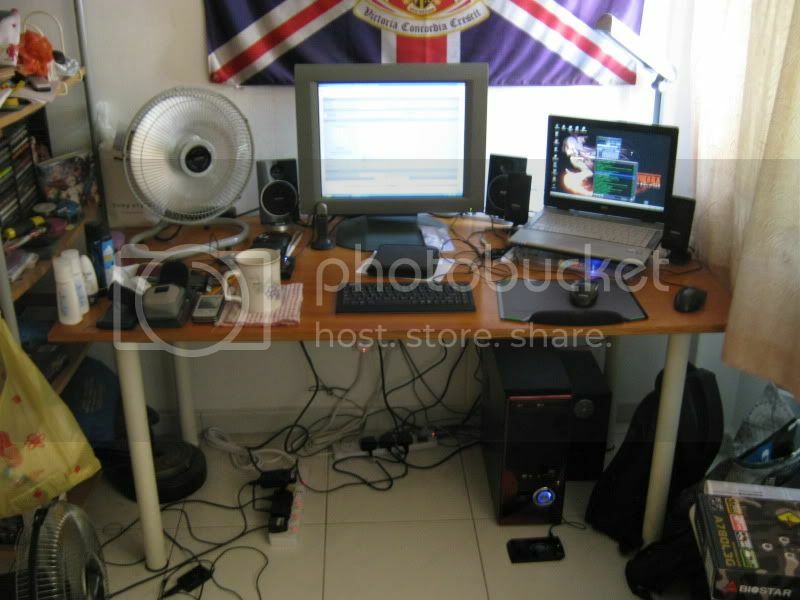 Click here to view the image in its original dimension. 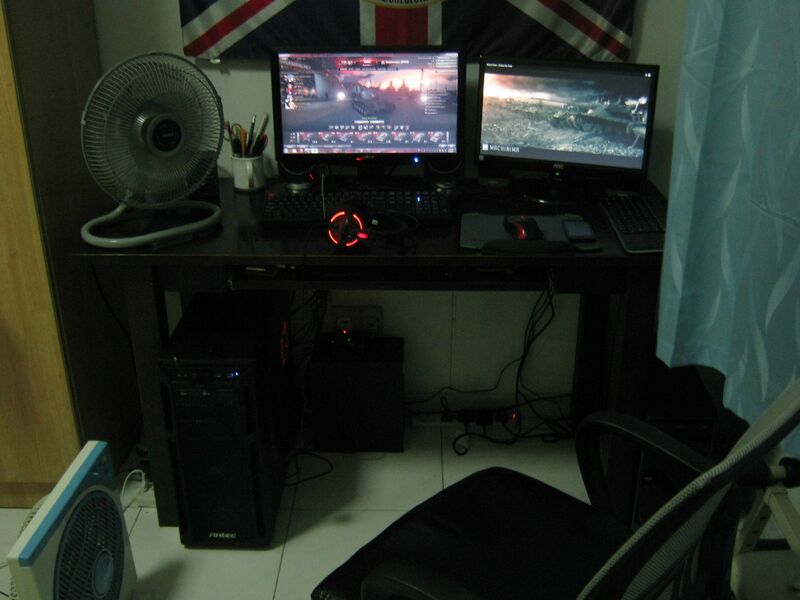 And my god the space, now I can upgrade anytime when needed. Image size reduced, original size: 2255 x 1692. 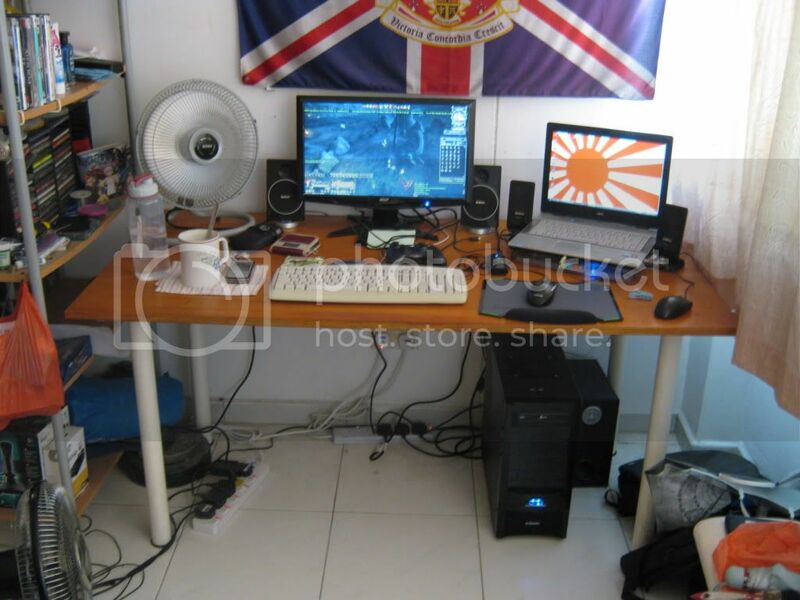 Click here to view the image in its original dimension. Image size reduced, original size: 1955 x 1466. Click here to view the image in its original dimension. 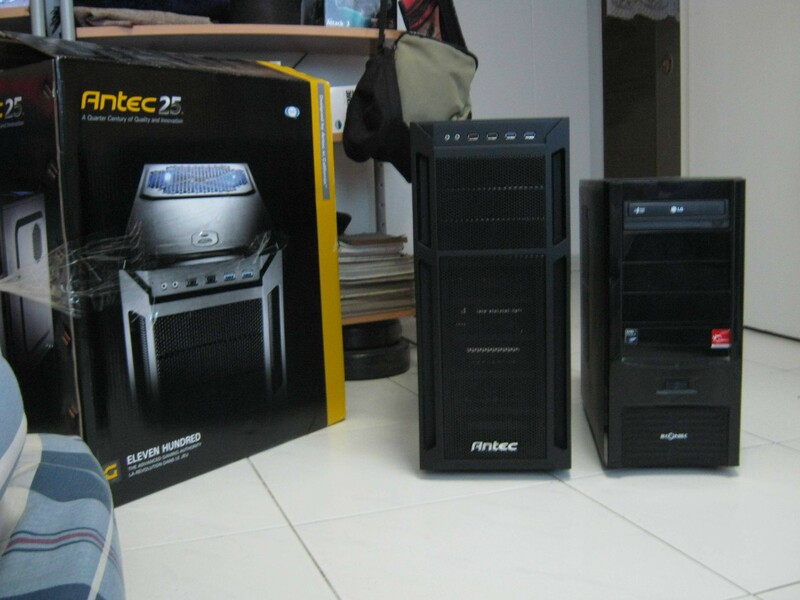 However, another change, as of 1st October 2013, the 2nd PC gets another cosmetic change. Another case, smaller this time round. And I've ditched the GTX550Ti in favour for the integrated graphics. 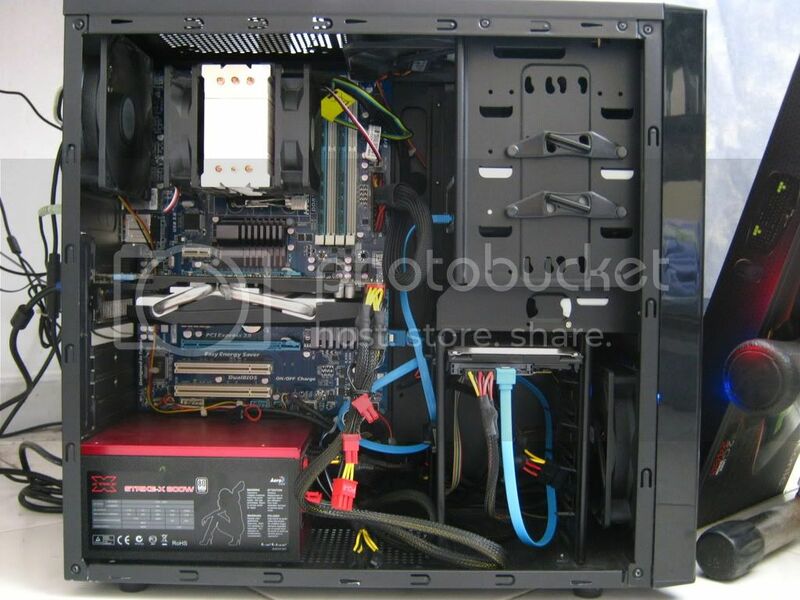 Since it's only just a work/media/facebook PC, why need the extra wattage for a dedicated GPU when the integrated one is just as good? Image size reduced, original size: 1280 x 960. Click here to view the image in its original dimension. Nevertheless, the PC progress continues on. The next upgrade is not even the PCs themselves. That table has to go.